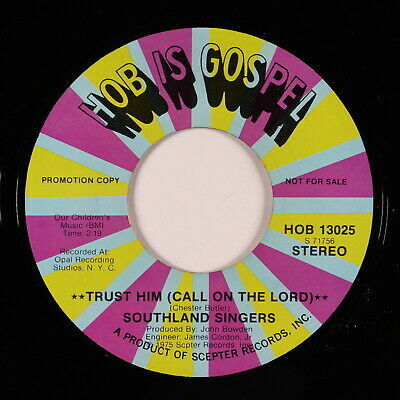 Carolina Soul weekly offering: 800+ soul, funk, deep, modern, sweet, and traditional black gospel 45s, pt. two of a large two part set. To browse the listings, please click . Update your internet browser to latest version in order to play audio clip. All records are vintage pressings unless otherwise noted. Grading Scale Sealed Jacket sealed shut in shrink wrap; disc sold ungraded or "as is". NM Appears unplayed and will bear no marks, sleeve scuffs, or scratches. We seldom use this grade. VG++ May have one or two visible imperfections (i.e. sleeve scuffs, faint scratches, or other superficial marks) that will not affect play. VG+ A few visible imperfections. These may include sleeve scuffs, light scratches, or other superficial marks. VG Same imperfections found on VG+ records but in slightly greater numbers. Records graded VG and above will typically not have any scratches that are deep enough to be felt with a fingernail. VG- A number of visible imperfections; the presence of a considerable number of light scratches will force a VG- grade, as will the presence of significant isolated defects such as scratches deep enough to be felt with a fingernail. G Pervasive imperfections of varying degrees including both light scratches and scratches deep enough to be felt with a fingernail. G+ and G- are used to indicate stronger and weaker copies within this range. All records are visually graded by our experienced staff, using a bright lamp and a well-calibrated turntable. LPs and 12-inches ship via USPS Media Mail (domestic) or USPS First Class International. 45s ship via USPS First Class (domestic) or USPS First Class International. All international orders over 4 lbs ship via USPS Priority International. All orders are eligible for combined shipping. If you are bidding on multiple items in a single auction, please wait to pay until all of the items you bid on have ended. International customers: large orders may be eligible for a shipping discount based on actual postage cost. Contact us for more information. Customers have up to three weeks to pay for won items. This window allows customers to bid across multiple auction cycles and then combine shipping. If we do not receive payment by the Friday before three weeks' time has elapsed, Unpaid Item Cases in eBay open. If this happens, orders can no longer be cancelled. Cases remain open for one week. If subsequent payment is made, UPIC(s) will be removed with no penalty. Otherwise, these cases close and the buyer's eBay account will receive a strike. Failure to complete payment before an UPIC closes may result in a block. Customer support staff is available to address all questions and concerns via eBay message, Mon - Fri 10a - 6p EST. We do everything we can to provide a smooth, reliable, and friendly shopping experience. Our records come with a satisfaction guarantee; if a purchase does not meet your expectations, please contact us. We pay top dollar for quality record collections. Contact us if you are interested in selling your collection or to inquire about our consignment services.